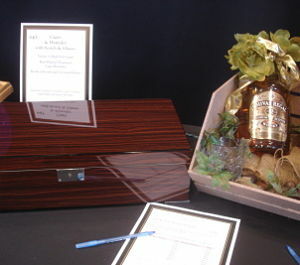 This humidor and scotch combo was the first item to receive a bid in the silent auction last fall. Smoking is one of those habits many wish to break. Unless you’re part of a spiritual community that bans it at your gala, hit “print” and use this article to make money on that vice. You might not like smoking. You might like pipes but not cigars. You might smoke cigarettes, but hate cigar smoke. Unless you’re the big spender procuring and buying ALL of the items at your gala, check any righteous attitude you hold. Do what’s best for the cause — procure some cigar-themed goodies to raise cash. Cigars and related paraphernalia are great nonprofit silent auction items. The February 2012 issue of Cigar Aficionado (which landed on my doorstep last weekend for no apparent reason) lists the best cigars of the year. Maybe your local cigar shop will donate a few? The issue reviews what is presumably the largest cigar celebration in the world, The Big Smokes. The Big Smokes are held in Las Vegas in late October and New York City in late November. It might be worthwhile to send an email to the organizers to see if you can get two complementary admissions to either event. Build a package around it. Humidors, cutters, a subscription to the magazine … all of those sell. See what you can procure and watch how quickly it disappears from the silent auction table. P.S. If you’re seeking other item ideas, claim your free copy of “What Sold Like Heaven in 2011.” It’s hot off the press!